Don & Jane opened their gallery at the Willows & Wetlands Visitor Centre in October 2013 after over 6 years of attending country fairs and shows, specialist railway events etc. 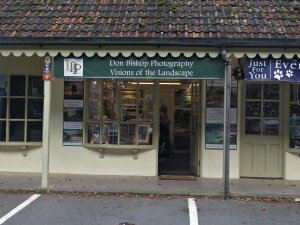 across the south west and further afield where Don’s work became well known and increasingly popular with many regular customers having multiple framed prints on their walls. From September 2018 the gallery has been relocated to 2 Queens Row, The Cliffs, Cheddar Gorge, Somerset, BS27 3QE. Approx 20 mins from the M5 Junc 22. We have several racks of prints for you to choose from and can also show you further images from our digital catalogue on the computer if you are looking for images not on display. We also have greetings cards, Don’s 6 books on west country heritage railways and a small selection of pottery and Blueberry Glass. There is of course plenty to do in the Gorge when visiting us to “make a day of it” and we situated right in a Pay & Display car park so no problem parking. Why not pop in and browse our images? We’d be delighted to see you. But before making a special journey to see us please do check the website or call us to make sure we are open – as we do have to go out and about to get and make the great images you see in our gallery. Leave the M5 at Junc 22 (Highbridge & Burnham-on-Sea) and follow A38 back towards Bristol. Turn half right at roundabout near East Brent to continue on A38, pass through Rooksbridge, Biddisham & Lower Weare and then turn right onto A371 towards Axbridge and Cheddar. Follow this road past Axbridge and turn left at petrol station onto B3135 into Cheddar village. The Gorge will appear on this road after approx 1 mile and the gallery is located on the left approx 500yds into Gorge adjacent to a car park opposite the Caves attraction ticket office. Postcode for Sat-Nav is BS27 3QE. Leave the M5 at Junc 21 (Weston-Super-Mare) and follow A370 towards Weston-Super-Mare town and sea-front, a dual-carriageway for approx. 1 mile, incl roundabout at West Wick, and turn left at roundabout onto A371 towards Banwell, Winscombe, Cheddar and Wells. Proceed along this road past Banwell and continue straight on at end of village on A371 (i.e. don’t take A368 left turn). Continue through Winscombe and turn right at traffic lights onto A38 and head south for approx 1/2 mile and bear left onto A371 slip road towards Cheddar and Wells. Follow this road past Axbridge and turn left at petrol station onto B3135 into Cheddar village. The Gorge will appear on this road after approx 1 mile and the gallery is located on the left approx 500yds into Gorge adjacent to a car park opposite the Caves attraction ticket office. From Wells follow A371 from the city centre past turnings to Wookey Hole and through the villages of Westbury-sub-Mendip and Draycott. Enter Cheddar main village and turn right onto B3135 and the Gorge will appear on this road after approx 1/4 mile and the gallery is located on the left approx 500yds into Gorge adjacent to a car park opposite the Caves attraction ticket office.